Join us for a live webinar on December 19th at 1:00 EST to discover how visualized workforce analytics complements your existing capabilities and empowers you to quickly and easily make more informed HR decisions. Learn how you can easily manage, monitor, and understand KPIs across your organization in one interactive view with Macromicro OrgInsight. Workforce analytics does not have to be complicated nor expensive. 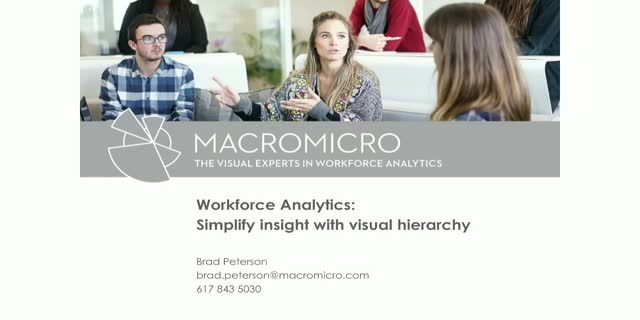 See live how Macromicro OrgInsight’s flexibility allows users to address standard use cases and any ad-hoc HR inquiry. The era of the ubiquitous software company has arrived, driven by application software advances and the cloud. Savvy executives are seeking to leverage the latest technologies to help them optimize business processes and are turning to independent software vendors (ISVs) for support. By extension, ISVs are exploring how to optimize their use of the cloud, ensuring they have the necessary technical foundation and cloud-related partnerships in place to innovate, grow their business, and deliver on customer expectations. In November 2018, IDC interviewed 12 SAP PartnerEdge partners embedding SAP technology in their commercial software to find out what considerations they took into account when selecting a cloud platform provider. Hear from one of the interviewed partners, Sodales Solutions founder Sana Salam, and SAP executives as they discuss the catalysts driving cloud adoption for commercial software, SAP Cloud Platform, and the benefits of the SAP PartnerEdge program. • Sana Salam, Founder and President of Sodales Solutions Inc.
For many organizations, work is now untethered – conducted everywhere from taxis to client offices to mountaintops and your customers are looking to stay competitive with access to live business data on a secure mobile platform, wherever and whenever they choose. Join us March 7th and learn about building and monetizing mobile cloud-based applications built on SAP Cloud Platform. With the SAP Cloud Platform SDK for iOS you have the tools needed to create and deploy powerful mobile apps combining the latest features from the iPhone and iPad with enterprise grade requirements. Hear from SAP executives as they discuss the benefits of the SAP PartnerEdge Build program offering, SAP Cloud Platform, and the latest SAP Cloud Platform mobile tools and technology. Discover the opportunity and let us help you speed your time-to-market, mobilize your customers and grow your business. Join us November 29 to learn all about building and extending cloud applications with intelligent blockchain services. Find out how, as a solution provider or independent software vendor (ISV), you can enhance business processes with distributed ledger technology in the cloud − fast-tracking blockchain implementation across your applications. Join us to hear from SAP product and program experts and our ISV partner, Huru Systems. This Webinar discussion will include the SAP PartnerEdge program “Build” engagement model, developing and extending cloud solutions with blockchain services, and empowering customers with the next-level of intelligent solutions. For many organizations, work is now untethered – business is conducted everywhere from taxis to client offices to mountaintops. To reap the benefits, and stay competitive your customers need to access live business data on a secure mobile platform, wherever and whenever they choose. Learn more about building and monetizing mobile cloud-based applications built on SAP Cloud Platform. With the SAP Cloud Platform SDK for iOS you have the tools needed to create, deploy, and manage powerful mobile apps combining the latest features from the iPhone and iPad with enterprise grade requirements like secure access to business systems and offline synchronization. Hear from SAP executives as they discuss the benefits of the Build engagement model of the SAP PartnerEdge program, SAP Cloud Platform, and the latest SAP Cloud Platform mobile tools and technology. Join us October 23 to learn all about building and infusing cloud applications with intelligent, easy-to-use machine learning (ML) services. Find out how, as a solution provider or independent software vendor (ISV), you can enhance business processes and software applications with intelligence - unlocking knowledge from structured and unstructured data such as images, text, time series, and tabular data by consuming easy-to-use APIs. As part of this Webinar, you’ll learn how the SAP PartnerEdge ‘Build’ program enables you to bundle SAP technologies with your IP to deliver cloud-based services for machine learning, enabling customers with the next level of intelligent solutions. Join us in this online session to learn about the new SAP PartnerEdge Open Ecosystem – Build engagement model, launched last June. This partner program is targeted at independent software vendors (ISVs), startups, and other companies interested in building commercial applications using SAP technologies. SAP PartnerEdge Open Ecosystem – Build offers a low-barrier entry into the Build engagement model of SAP PartnerEdge. In this session, you’ll learn how to start exploring SAP technologies and develop your applications through this program offering. You’ll also learn about the recent improvements to the program and how this entry level partner offering compares with SAP PartnerEdge – Build engagement model for full partners. The same reasons that motivate an organization to adopt a data management platform as a service should also be explored by independent software vendors (ISVs) and solution providers for their packaged applications. Whether you’re extending an existing application, building new applications, or modernizing your software offering, transitioning to the cloud with a platform-as-a-service solution will enable you to reduce your infrastructure expenditures while bypassing the effort and resources involved in configuring, provisioning, and updating infrastructure. Join us September 18 to learn how SAP PartnerEdge − Build, SAP Cloud Platform, and the SAP HANA business data platform ‒ the most advanced data platform technology that is fully managed across multi-clouds ‒ can support you to break cloud boundaries, innovate with intelligent technologies, and rapidly deliver business-ready cloud applications. With the advent of cloud computing and as-a-service providers, organizations are meeting their solution needs in new ways in order to become more intelligent enterprises. As a result, many value-added resellers, consultants, and system integrators are exploring new business models with a focus on packaged software. The addition of a packaged software business model opens new opportunities for growing your company’s value. Take advantage of your existing industry and functional development expertise to drive repeatable and scalable revenue from packaged software as a service. Join us July 17 to learn how the SAP PartnerEdge program can support you in extending your existing business model to include packaged applications by rapidly commercializing solutions based on SAP Cloud Platform and SAP intelligent technologies. Hear firsthand from our resell- and service partner, Incture Technologies, about moving into the packaged app world! Join SAP and partner executives as they discuss a packaged software model and how you can act as the enabler for your customers evolution towards an intelligent enterprise based on SAP Cloud Platform, SAP intelligent technologies and SAP PartnerEdge – Build. The iterative delivery of software solutions that continuously provide a better user experience and enable higher user productivity is critical for independent software vendors (ISVs) who want to increase license sales by driving solution adoption. Join us on May 15 to learn how you can modernize your software user experience (UX) and improve user adoption and relevancy, all while you drive down the cost and time required to develop enterprise applications. Find out how, as an SAP partner in the SAP PartnerEdge program, you can personalize and simplify your solution user experience. With SAP Cloud Platform Experience Maker services, a set of end-to-end UX tools and support, you can rapidly prototype, build, and deploy rich enterprise applications based on SAP Cloud Platform. SAP Cloud Platform Experience Maker services enable you to simplify business application development by providing the tools to accelerate productivity – from collaboratively designing prototypes and developing highly functional experiences, to packaging, deploying, integrating, and managing the corresponding applications. Join us and learn about SAP Experience Maker, the Build engagement model, and how you can create apps with a modern UX design based on SAP Cloud Platform. With increasing digital disruption and demand for rapidly evolving business software, independent software vendors (ISVs) and software providers are looking for an open platform as a service (PaaS) that offers high-value innovation capabilities as well as a broad choice of programming, database, and multi-cloud deployment alternatives. Join our Webinar and learn how you can tap into multi-cloud deployment scenarios. Find out how you can benefit from the features of SAP Cloud Platform, our PaaS; Cloud Foundry services; and the “Build” engagement model of the SAP PartnerEdge program* to rapidly innovate and build multi-cloud apps. Join us and explore the creation of new business models based on multi-cloud deployment models that help drive end-to-end digital transformation for your customers. * Learn more about the “Build” engagement model and SAP Cloud Platform at the Application Development Partner Center. The evolution of connectivity, Big Data management, analytics, and the cloud is enabling organizations to converge operational and information technologies. IT leaders are looking to take advantage of this convergence through responsive applications that span from edge sensor data to functional and industry business processes. This expectation is driving new opportunities for software vendors who can now integrate edge sensor data with real-time data processing and analytics, to go from sensor to business outcome. Join our Webinar and learn how, as an SAP partner in the “Build” engagement model of the SAP PartnerEdge program*, you can take advantage of open development technologies to build and distribute rich Internet of Things (IoT) applications based on the SAP Cloud Platform Internet of Things services, including the application enablement option. Join us and explore the creation of new business models that drive end-to-end digital transformation for your customers. The accelerated adoption of industry-specific cloud solutions has made discrete manufacturing one of the largest growth opportunities for solution providers and independent software vendors (ISVs). With over 37,000 customers in the discrete manufacturing sector, SAP, our industry innovation, and SAP partner programs can play a vital role in supporting software providers that are looking to access this growth market. Join us on Thursday March 22 and learn about SAP’s strategy for discrete manufacturing industries covering automotive, industrial machinery & components, high tech, and aerospace & defense. Participants will hear about the opportunities to build and monetize industry cloud apps with SAP Cloud Platform as extensions to SAP S/4HANA Cloud, SAP Hybris solutions, or SAP SuccessFactors solutions. As a savvy software provider, you’re looking to capitalize on the latest tech trends and enable customers to master digital transformation. But it’s a constant balancing act – weighing development cycles against customer requests. With SAP Cloud platform, the Platform as a Service (PaaS) from SAP, you can build modern cloud apps and microservices using open standards that use the skills you already have – enabling you to connect systems at the edge to core processes, move to the cloud, and deliver on customer expectations. Join us November 21 for an online Webcast designed to help ISVs explore the benefits of building and integrating digital apps using SAP Cloud Platform and SAP API Business Hub. Find out how, as an SAP partner in the “build” engagement model, you can take advantage of partner benefits and cloud platform technology to connect everything, speed time to market, and build on the open standards that you’re already invested in. Join us and start building apps of the future, making the most of what you know today. - Harsh Jegadeesan, Head of Product Management, Digital Transformation Services, SAP Cloud Platform. The evolution of connectivity, Big Data management, analytics, and the cloud is enabling organizations to converge operational and information technologies – IT leaders are looking to leverage this through responsive applications for line-of-business and industry-specific end-to-end processes. This expectation is driving new business opportunities for software vendors who can now integrate edge sensor data with real-time data processing and analytics, to go from sensor to business outcome. Find out how, as an SAP partner in the “build” engagement model, you can pursue this business opportunity by building and distributing rich IoT applications based on the SAP Cloud Platform Internet of Things service and Cloud Foundry services. Register now to begin exploring a partnership with SAP, creating new business models, and driving end-to-end digital transformation for your customers. With digitalization comes the increasing demand for rapidly evolving business software. And a flexible, open development platform is paramount to facilitating the creation of innovative, next-generation applications and enabling faster time to market. ISVs and software providers looking for a platform as a service (PaaS) that offers high-value innovation capabilities as well as a broad choice of programming languages, database options, and multicloud deployment alternatives are increasingly exploring their partnership options with SAP. Find out how, as an SAP partner in the “build” engagement model, you can take advantage of our open development technologies and rich capabilities when you prototype, build, and monetize functionally rich applications based on SAP Cloud Platform and Cloud Foundry services. Join our Webcast and learn from partner and SAP experts about how you can benefit from the features of SAP Cloud Platform and the “build” engagement within the SAP PartnerEdge program. Scott Harrison - SAP / Kevin Hemberger - Cargill / Joe Gormley - Enterprise Information Resources Inc.
Manually consolidating, manipulating, and formatting reports not only requires enormous effort, it is also a slow, error-prone undertaking in a business climate that requires rapid, accurate insight and efficient processes. Recognizing an opportunity to improve its compensation decision-making process, Cargill implemented an SAP Cloud Platform-based extension for SAP SuccessFactors that automates compensation reporting and provides managers, HR business partners, and executives quick and easy access to timely, actionable compensation cycle summary data and detailed analytics. • Automatically generate actionable compensation analytics for every user while retaining role-based security. • Eliminate time-consuming data manipulation and reformatting and reliance on external tools. • Streamline and simplify the annual compensation cycle reporting process and increase the efficiency of managers, HR, and compensation teams. - Kevin Hemberger, Global Compensation and Mobility Technology Lead, Cargill, Inc.
- Joe Gormley, Senior Vice President, Enterprise Information Resources Inc. Organizations today are faced with the challenge of creating, viewing, and printing org charts and HR reports quickly and easily, displaying critical KPIs and complex workforce data in an attractive, modern visual format. Planning reorganizations and modeling new structures based on org unit, position, and people hierarchies using intuitive drag-and-drop features that are integrated with your SAP SuccessFactors system can make a big difference and go far beyond simple org charting. In today’s world of digitization there is an increasing dependence on sophisticated business software to rapidly evolve and deliver an intuitive user experience – not just to keep training and support cost low but – most importantly – to keep employee motivation up. If you are interested in driving down application development costs and time by up to 50% while vastly improving user adoption and relevancy, join us for this exciting webinar opportunity July 20 2017! Find out how, as an SAP partner in the Build engagement model, you can rapidly prototype, build, and monetize functionally rich applications for the integrated business processes of SAP’s 350,000 customers - based on SAP Cloud Platform. • Rapidly build and deploy business applications in the cloud for faster time to value. • Securely integrate with your SAP and third-party (non-SAP) cloud and on-premise systems for greater agility and productivity. • Embed advanced analytics into your solutions to gain real-time insight and drive customer satisfaction. • Leverage our digital channels and flexible license options to market your packaged solution to 350,000 SAP customers. Join us on this webcast and learn about the partner experience and how you can benefit from the features of SAP Cloud Platform and the Build engagement within the SAP PartnerEdge program. To find out more about the SAP PartnerEdge program and SAP Cloud Platform, visit our Application Development Partner Center. Join SAP and Zebra Technologies to learn how you can partner with SAP to develop and monetize your own applications connecting Zebra devices using SAP Cloud Platform services. The session will also highlight the asset intelligence solutions and services which you can leverage with your own manufacturing, logistics, healthcare and retail applications to drive increased worker productivity and product line efficiency for your customers. Don’t miss this opportunity to hear from product experts and senior members from both SAP and Zebra Technologies! This SAP BrightTalk channel is designed to help ISVs and other organizations developing and selling commercial software explore a co-innovation partnership with SAP. Whether you’re extending SAP applications or developing new software our fully-fledged ISV partner programs give you the resources you need to rapidly develop next generation apps, integrate with SAP platforms, monetize your solutions and reach SAP Customers. Engage now and give your customers the best of all worlds, unparalleled SAP technology, rapid innovation, world-class cloud and on premise deployment options, paired with your own deep industry knowledge.